Gold traded either side of unchanged last night in a relatively tight range of $1285.40 - $1290.40. It softened to its $1285.40 low during late Asian and early European time where it found support ahead of the $1285 low from 3/8. The yellow metal was pressured by some modest strength in the US dollar (DX from 97.24 to 97.47) which was lifted by weakness in the pound ($1.1318 - $1.3013, UK MPs failed to reach majorities on 4 new Brexit alternatives last, May in crisis talks with her cabinet today, April 12 deadline to crash out looming) and the euro ($1.1214 - $1.1189). Global equities were also a headwind for gold as they retained a firm tone with the NIKKEI flat, the SCI +0.2%, European markets were up from 0.3% to 0.7% and S&P futures were +0.1%. Stocks were aided by another gain in oil (WTI to $62.19, fresh 5-month high) on better demand prospects from China combined with ongoing supply issues from Venezuela and Iran. However, the yellow metal rebounded to its $1290.40 high during late European time - despite the DX remaining firm - aided by a dip in the US 10-year bond yield from yesterday’s surge to 2.506% to 2.471% and some bargain hunting buying near the 1-month low. At 8:30 AM, a worse than expected reading on US Durable Goods (-1.6% vs. exp. -1.2%) pushed S&P futures lower (2874 – 2868), and took the US 10-year bond yield down to 2.478% (after a prior bounce to 2.285%). The DX only had a modest tick down to 97.34, and gold - which had retreated to $1288 - bounced to make a fresh high at $1290.50. US stocks opened weaker and softened into the late morning hours (S&P -8 to 2858) with losses in the Consumer Staples, Energy, and Health Care (Walgreens clobbered on weak earnings / lower forecast) sectors weighing. 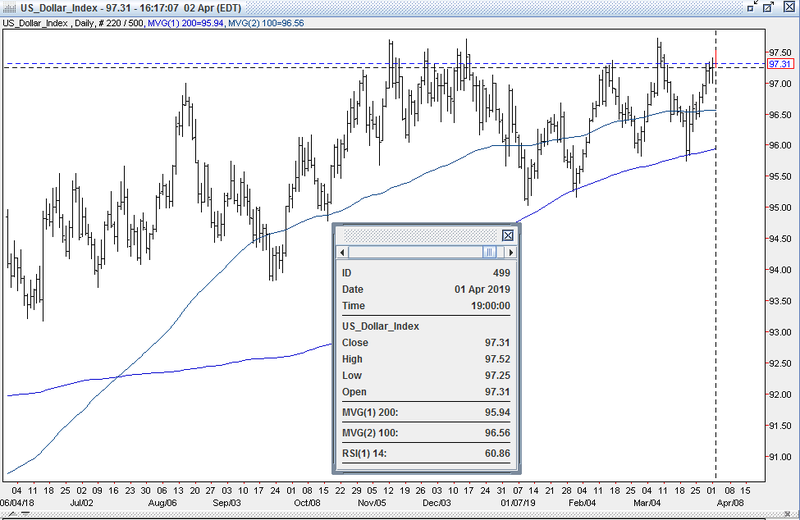 The 10-year yield was choppy but was tugged down to 2.474%, but the dollar firmed (DX to 97.51). The greenback was aided by continued softness in the euro ($1.1185, EU’s Barnier warns no-deal Brexit more likely) and weakness in emerging market currencies (Turkish lira, Brazilian real, S.African rand). 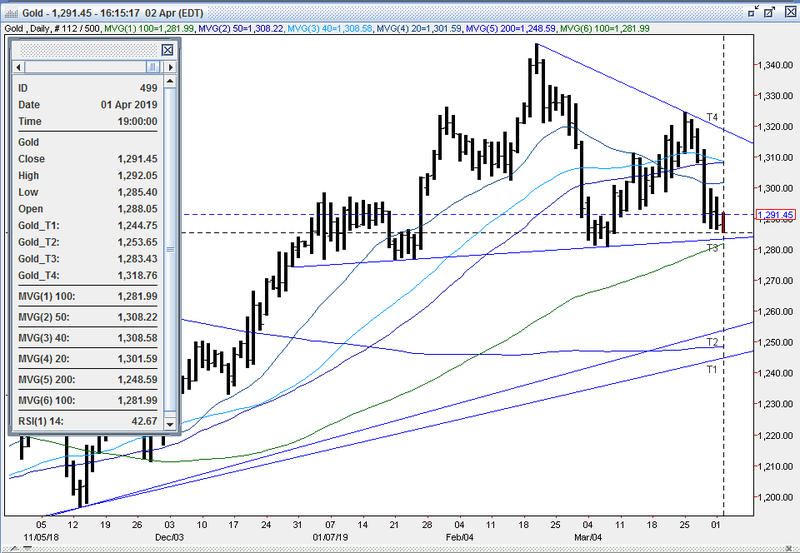 Gold was caught in the cross currents, but traded higher, reaching $1291.80. Into mid-day, US equities battled back to unchanged (S&P 2866) with the Materials and Communication Services sectors leading the rebound. This was despite some downbeat comments by the IMF’s Lagarde on US and global growth prospects (global economy is in a delicate moment and losing momentum, 70% of economy slowing down, US not immune to the deceleration). The 10-year bond yield rose to 2.49%, and the DX ticked up to 97.52. Gold slid in response, and retraced back to $1289. In the early afternoon, the dollar was pressured by an announcement from PM May early calling for a short extension to Article 50, looking to leave the EU by 5/22, and looking for unity and compromise with the Labour Party to agree on a plan to submit to the EU next week before the 4/10 EU summit. The pound ($1.3131) and euro ($1.1216) shot higher, as the DX sank to 92.26. 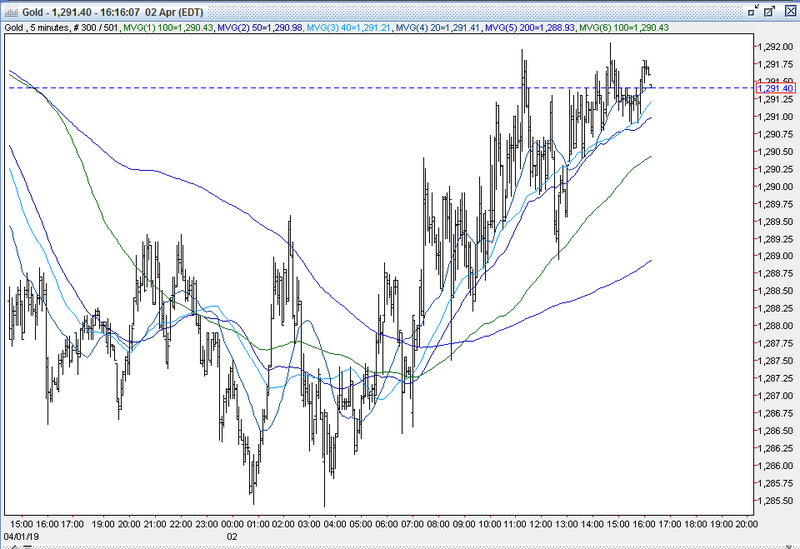 Gold reversed and moved higher to $1291.75, but was unable to take out its prior high. Later in the afternoon, the S&P made a fresh high at 2870 (helped by oil continuing to rally -$62.73) before finishing fractionally higher at 2867) while the 10-year yield ticked down to 2.475%. 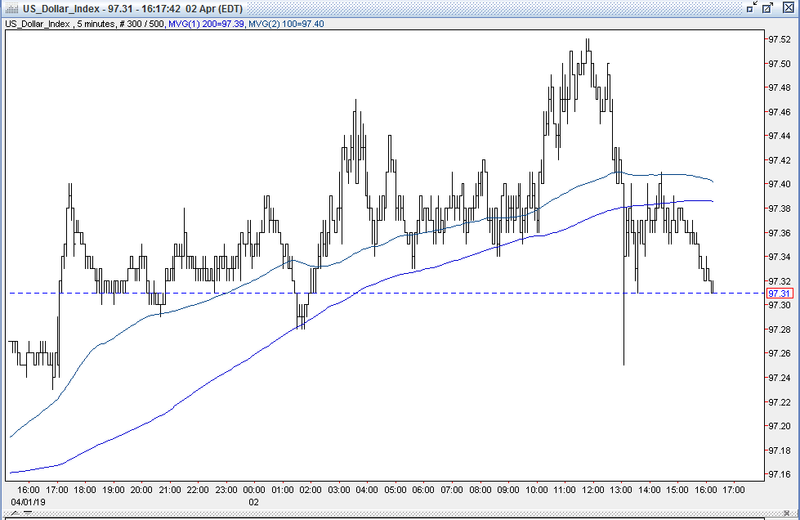 The DX was a little choppy between 97.30 – 97.40, and gold backed off to $1290.75. Gold was $1291 bid at 4PM with a gain of $3. Open interest was off 2.9k contracts, showing a net of long liquidation (along with some profit taking from shorts) during yesterday’s decline. Volume was lower with 244k contracts trading. Bulls were encouraged that gold held support at $1285 - ahead of the head and shoulders pattern neckline support at $1283 – and rebounded with a modest gain. They were pleased that it finished firmer despite a stronger DX, the slight gain in the S&P, and the US 10-year bond yield holding above 2.47%. Bulls feel the selloff from $1325 has been overdone and have used the dips to get long (er) at more attractive levels. Bulls also maintain that gold’s correction down from $1347 had been overdone, and feel that it will consolidate again in front of the confluence of support levels from $1283 down to $1277. Bulls feel that the trend is their friend and that the up move going back to the 8/16/18 $1160 low is still intact. They look for the strong rally over the past 7 months to carry further, expecting continued volatility in equity markets along with the surprisingly dovish statement from the Fed at its last meeting to keep downward pressure on US interest rates (US 10-year yield flirting with 15-month lows) and the dollar, which should help drive gold higher. Bulls also point to last Friday’s Commitment of Traders Report (as of 3/26) that still has the large funds with a significant gross short position (95k contracts). Therefore, the bulls feel the gold market remains set up to move higher, as these shorts will provide fuel to further upside moves – when forced to cover. Bulls look for a consolidation ahead of $1277-83, and then for a quick rebound to the old support at $1300 - $1303. Some bears were disappointed with gold’s advance today, but others are comfortable with its recent price action, making 6 consecutive lower highs and lower lows on its move down from $1325. Bears believe gold’s downside has legs, and maintain that its recent bounce from $1281 was just a modest uptick within the early stages of a more significant downside correction. Though some bears took some profits toward the $1283 head and shoulders neckline today, other bears still remain comfortable selling into strength and will continue to use rallies as entry points for getting short(er). They maintain that gold’s advance to $1347 had been overdone – having rallied $70 since the $1277 low on 1/24 (5.48%), $114 since the $1233 low on 12/14 (9.25%), and $151 since the $1196 low on 11/13 (12.63%). They feel that the 20% correction in equities – much of which occurred during very illiquid holiday trading – was also overdone, and expect the rebound seen over the past 13 weeks to resume (encouraged by golden cross in the S&P – 50 day moving average crossed 200-day moving average). Bears also feel that the strength in the US dollar has legs – despite the surprise dovishness from the Fed the week before - given the lousy Eurozone data last Friday that forced the German 10-year bund yield back into the red. They feel that the US remains the sole global growth engine, and will continue to grow – despite the pronounced slowdown in global growth prospects. This, they feel, should keep the US dollar well bid (8 of last 9 sessions of higher lows, and higher highs) and will continue to pressure gold lower. Bears expect further long liquidation to resume, and look for a breach of initial support at $1285 (double bottom 3/8 and 4/2 lows) to lead to a test of the confluence of technical support just below: $1281-84 – quadruple bottom 3/4, 3/5, 3/6, and 3/7 lows, $1283 – up trendline from 12/28 $1274 low, $1282– 100-day moving average, $1277-80 - 7 bottoms – 12/28, 1/4, 1/21, 1/22, 1/23, 1/24 and 1/25 lows. Bears feel that a breach of these levels should trip more significant long liquidation that will open up a move into the mid $1260’s. All markets will continue to focus on geopolitical events (especially Brexit news), developments with the Trump Administration (especially on US-China trade, potential legal issues), oil prices, and will turn to reports tomorrow on Japan’s Services PMI, China’s Services PMI, Eurozone PMIs and Retail Sales, UK PMI, US MBA Mortgage Applications, ADP Employment Change, Markit Services PMI, ISM Services, Oil Inventories, and comments from the Fed’s Kashkari for near term direction.